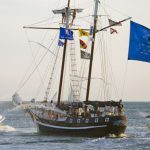 Our native Florida Keys residents proudly call themselves “Conchs” (pronounced konks) after the hardy sea mollusk that lives in area waters — and their island home is known as the Conch Republic. Today’s blog focuses on one of our city officials, a fifth-generation Conch who plays an integral role in helping protect our island paradise. 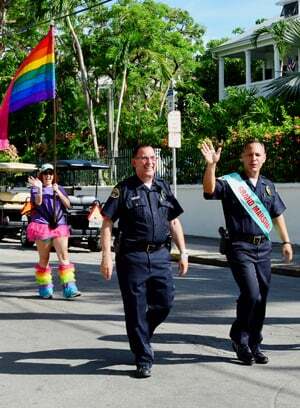 Key West Police Chief Donie Lee (right), wearing a Grand Marshal sash, marches with colleague Steve Torrence in an LGBTQ celebration in Key West. Donald J. Lee Jr. (aka Donie Lee) joined the Key West Police Department in 1994 and, after several promotions, was appointed chief of police in 2008. The widely admired officer is also our first openly gay police chief, and joined the ranks of many other LGBTQ city officials both past and present. Chief Lee has a staff made up of two captains, six lieutenants, eleven sergeants and dozens of officers. His department patrols the island by car, motorcycle, boat — and there’s even a mounted unit with three beautiful horses named Paco, Shmoo and Scout. 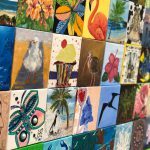 Keys Voices: What are some of your fondest memories of growing up in Key West? 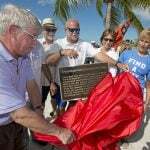 Donie Lee: I have so many great memories of growing up in Key West. 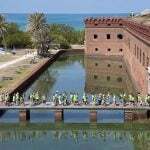 Riding my bike around Key West, fishing with friends, picking Spanish limes, tamarinds, and mangoes — then selling it on the sidewalk of the Hemingway House to visitors. KV: What were some of your inspirations for starting your career in law enforcement? DL: Not sure about a specific inspiration but I believe I was born to do this job. Police work has always been something I have been fascinated with since childhood. I’m lucky to be living a childhood dream. KV: As an openly gay man, did you experience any obstacles in your career path? DL: Fortunately, I didn’t experience many challenges in my career because of my sexual orientation. I think working in Key West has a lot to do with that. We are a progressive and accepting city. 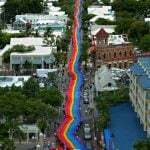 KV: How would you rate the Key West police department’s openness and respect for the LGBTQ community? DL: I think our department has great respect for our LGBTQ community and I think our LGBTQ community has great respect for its police department. I wouldn’t have it any other way, being the police chief who happens to be gay! I expect all of our officers to treat all those we serve according to our core values of respect, integrity, fairness and service. 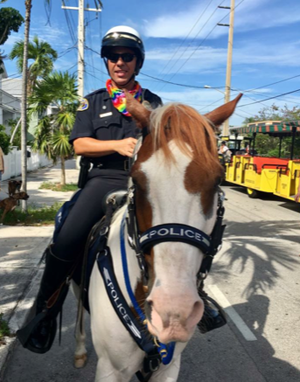 The chief rides one of the department’s equine “officers” in Key West’s Old Town. KV: What are some of your favorite things to do on the island in your free time? DL: Since we have great weather and live in paradise, I enjoy being outdoors and exercising. KV: Are you involved any community outreach programs? What are some of your favorite local LGBTQ organizations and why? DL: I serve as a mentor with Keys to Be the Change, Inc., at the high school. I think it is important to focus on our youth and being positive role models for them is important. 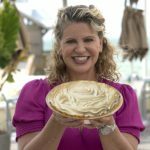 I also think the Key West Business Guild is an important organization to promote businesses and continue to make Key West an attractive gay destination. KV: Do you have any tips for “taking care in paradise” while you’re “out and about”? DL: Slow down and be aware. KV: What are some of your proudest accomplishments since you took the position of police chief? DL: During the last 10 years, we have reduced the crime rate in Key West by over 50 percent. I also believe that we have earned and maintained the community’s trust and confidence in its police department through professionalism.